College presidents around the country are gearing up to welcome their students to campus in innovative ways this fall. For many institutional leaders, opportunities to engage with students have increasingly become a priority to improve customer service for students and their families. On Tuesday, Morehouse College president Dr. David A. Thomas moved into Graves Hall – the oldest residence hall on campus at the all-male historically Black college in Atlanta – as a way to get to know the incoming men of Morehouse and to hear about their concerns. Thomas’ two-day, living accommodations marks his first Move-In Day as president because he assumed the role in early January. Thomas added that living in the dorm will give him a sense of how well Morehouse leaders are serving their students as the institution recently made changes in management of facilities to improve the student experience. Thomas has acknowledged that he wanted to attend Morehouse when he graduated from his Kansas City, Missouri high school nearly 40 years ago. He could not afford the tuition and instead, attended Yale University. Now as a “first-year” student, he has a chance to serve the incoming men of Morehouse through placing himself in their shoes — and residence hall. Presidential-student engagement models like Thomas’ are not new. College presidents have employed similar strategies to interact with their students and gauge their needs over the years, including living on campus, eating in the cafeteria or working out on campus. Father Michael Garanzini, chancellor and former president of Loyola University Chicago, lived in a dorm on campus, as well as former Georgetown University president Father Leo J. O’Donovan. The experiences offered the former presidents a perspective of what it meant to be a student on campus. Similarly, past president of Spelman College Dr. Beverly Daniel Tatum could be seen walking around campus as part of the institution’s Wellness Revolution that promoted healthy lifestyle habits. Dr. Sharon D. Herzberger, past president of Whittier College, walked more than 250 miles in her famous “Walk and Talks” with students, faculty and staff to learn more about their experiences on campus. Presidential visibility and discussions with students can “minimize student unrest” on campus and increase their level of satisfaction with the institution, said Dr. David Wilson, president of Morgan State University (MSU). 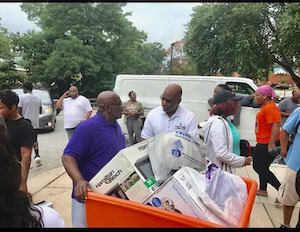 Morgan State University’s Dr. David Wilson talks with students and parents on Move-In day last year. A recruitment benefit of this increased student satisfaction, Wilson pointed out, can lead to students becoming better ambassadors for why others should attend the institution. Wilson will be helping students move into their dormitories this weekend — an annual ritual since his presidency began in 2010. His time helping incoming students move into their dorm rooms is a “wonderful” opportunity for students and their parents to meet MSU’s senior administrators, and it sends an initial message that the president is involved in student life, he said. “There is no wide gulf between the administration, particularly between the president and students,” Wilson added. When classes begin for students on August 20, he and other leaders, including the provost and vice president of student affairs, will be serving a continental breakfast consisting of orange juice, granola bars and fruits on the campus lawn. Beyond this, Wilson holds a town hall every semester and has an open-door policy whenever he is on campus where students do not have to “go through three secretaries” to see him, he said. He also eats in the dining hall two to three times a week, asking students what’s on their mind or how leaders can improve the school. Some students will hear him say, “Save your swipe, the president has your lunch today,” Wilson added. Throughout his presidency, he has traveled with the MSU choir on international trips to places such as Australia, Brazil, Germany, Austria and Slovakia. And at 6 a.m. every morning, he is in the university’s gym reading the news on the elliptical machine. “It’s good for [faculty and staff] to know that I have a life to live too,” he shared of his workout practices. A report on presidential engagement from the Penn Center for Minority Serving Institutions at the University of Pennsylvania highlighted that such transparency can improve trust and help students understand the demanding role of the presidency. “We are trying to build a culture where listening to our students is paramount,” Wilson said. Student feedback led to MSU experimenting with a 24-hour library service and increasing the visibility of school colors in strategic ways on campus. When students cross the stage at commencement each year, Wilson said he knows up to a half of the graduates personally and some of the challenges they go through. “I know what their tears represent” at graduation, he said.